GitBook is partnering with Gumroad to sell paid books. One of our big upcoming features is Marketplace distribution (with Google/Amazon/iBooks integration), and as part of this new strategy we’ve made the decision to phase out our own book purchase system in favor of Gumroad integration. All paid GitBooks are now automatically sold via Gumroad. A big motivation behind this decision, is a better and easier purchase experience. 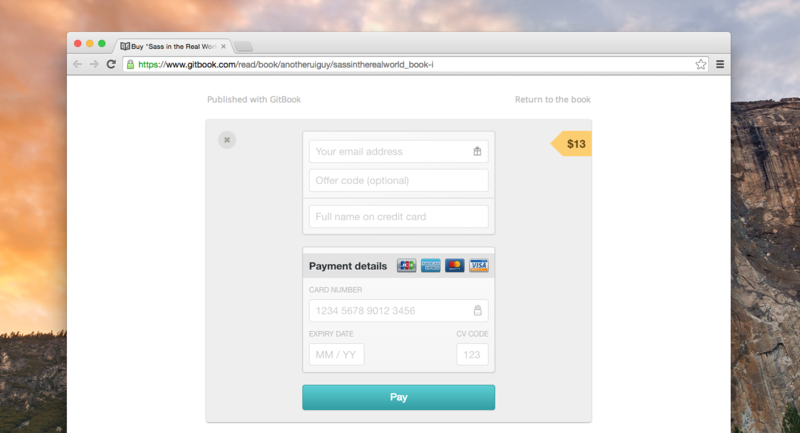 Readers no longer need to sign up to GitBook in order to purchase a book. Handing off the process of buying books to marketplaces has a few advantages, it allows GitBook to focus on building better tools for authors rather than yet another marketplace, and in the end offer a better and more cohesive experience for authors and readers alike. This improvement changes nothing for authors and their royalties, it only makes the purchase experience much better. Distribution to 3rd party marketplaces is a feature we’re actively working, in fact we’re currently beta-testing it. If you’re an author interested in getting your books in Google’s Play Store, Amazon or others, contact us and we’ll include you amongst our beta testers. Have feedback on this post? Let @GitBookIO know on Twitter, or contact us.